This page provides you with Quality Engineer resume samples that you can use for inspiration in writing your own resume, or for creating one through our easy-to-use resume builder. Below you'll find our how-to section that will guide you through each section of a Quality engineer resume. Quality Engineers like you are increasingly in high demand! You can get called QA or QC engineers, but either way, you are off to a great career! Fact is, yours is one of the most competitive and fiercest industries in the current market: in order to succeed, you must have the best resume a quality engineer can send to his future employer. You could be excellent at ensuring that final products are safe and meet customer expectations, but resumes are a completely different subject! Looking for inspiration in the big ocean of news and data that’s called Google is not easy, but don’t worry: if you were looking to get inspired by the best quality engineer resume sample in the market, look no further, we’ve got you! We have helped many professionals in your industry get to the next level and we want you to be next. Let us inspire you like we inspired 3 million people all over the world. You work with multiple stakeholders, at every part of the manufacturing process: your position is crucial to business success and, as such, crafting a strong quality engineer resume is important. Your best option in terms of format is still the reverse-chronological layout: it allows you to introduce yourself to the recruiter with your most recent achievements. Friendly tones are far better than a simple fact-to-fact style as it can often be off-putting. What is more, you don’t want to add a funny undertone rather a serious but warm undertone instead. It’s the same with the colors used in the resume. Use only one very basic color, usually black, and you’ll find it works far better than having a rainbow on your page. Big headings and clean white spaces will be very well welcomed by the recruiter! Last but not least: PDF is the way to go, in order to preserve its layout! You probably think this section is not really needed.You have a portfolio of projects you can just show to impress the recruiter, convincing you’re their best fit as a quality engineer. Use the words “best” more than twice. What should be added? Well, your recent work history for a start. Did you focus on any area of expertise such as quality control, Six Sigma, Quality Assurance and reliability Engineering? What positions have you worked at recently and what sort of experience did that provide you? These things must be added simply because it’s showing a recruiter why they should pick you. What is more, the history of your employment could allow a recruiter to say for certainty you’ve got the experience to work as a Quality Engineer in their organization. If you need more tips on writing the best work experience section for a great Quality Engineer like you, check out our detailed resume guide. Please don’t forget to add any educational training you’ve received or undertaken: it will help to make your education look more impressive. This is a very important section for a Quality Engineer resume as client’s are searching for specific skills that their hire must have to complete the job. 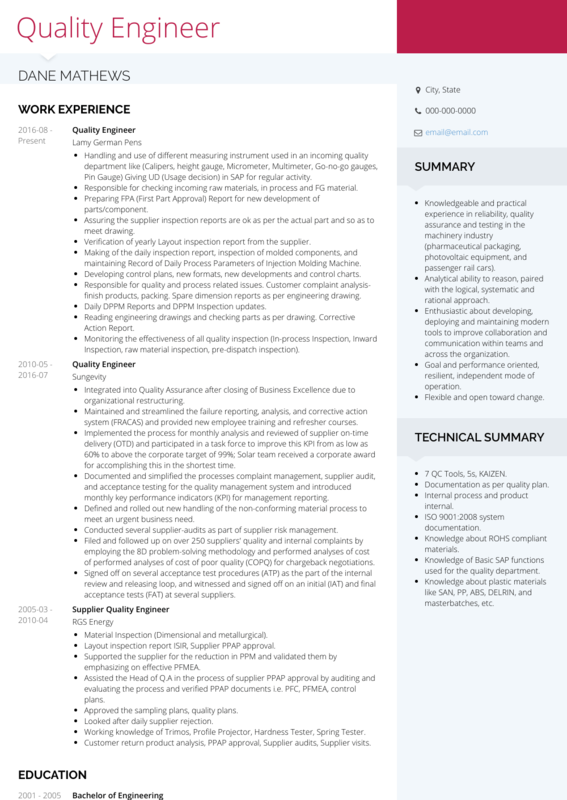 If an excellent Quality Engineer Resume sample is not enough, why don’t you check out one of the most efficient Quality Engineer resume templates in the market? Many professionals like you have successfully used it to take their career to the next level.